Sir Ronald Ross (1857-1932) was an expert in tropical medicine who had been awarded a Nobel Prize in 1902 for establishing the life cycle of the malarial parasite in mosquitoes, which led to the successful combating of the disease. ‘Next Thursday’ is 15 July 1915. Ross was being sent to Alexandria for four months to investigate the epidemic of dysenteric diarrhoea in the Mediterranean Expeditionary Force at the Dardanelles. Ross had a reputation for egocentricity and acerbity, so the tone and sensitivity of his letter to Kittie come as something of a surprise. It is possible that he was related to George’s great friend from St Petersburg times, the naval engineer Archibald Ross (1867-1931), and that Kittie had approached him through that connection, having been tipped off about Ross’s mission to Alexandria by Gertrude Bell. It would be interesting to know what the ‘Encl.’ was that came with Ross’s letter. Clearly, Kittie had written to him presuming that George was now ‘missing’ and possibly a prisoner. 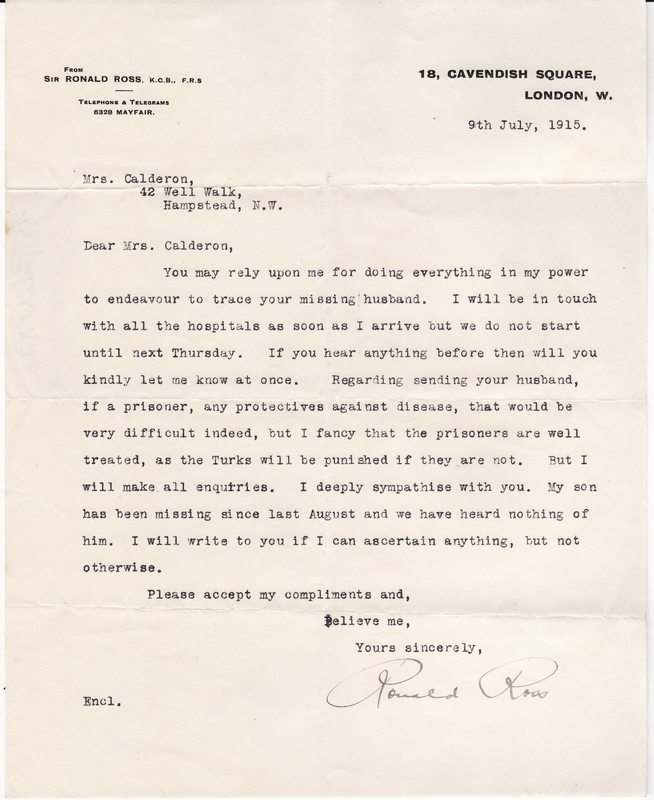 The only other communication from Ross in Kittie’s archive is a handwritten letter from Alexandria dated 22 August 1915. In this, Ross relates that at Alexandria he could discover only that George was ‘missing’, but wrote to the CO of the 1st KOSB, Major G.B. Stoney, who replied that, in Ross’s words, ‘there is very little hope of your husband being alive’. With his August letter to Kittie, Ross enclosed Stoney’s letter and one from Captain Hogan (see my post of 5 July), neither of which has survived. Ross’s son Ronald Campbell, described by him as ‘missing since last August’, had in fact been killed at Le Cateau in the retreat from Mons on 26 August 1914. This entry was posted in George Calderon, Timeline and tagged Alexandria, Battle of Mons, Battle of the Marne, Captain Hogan, Dardanelles, Gallipoli, George Calderon, Kittie Calderon, Le Cateau, Major G.B. Stoney, malaria, Sir Ronald Ross, The Great War, World War I. Bookmark the permalink.